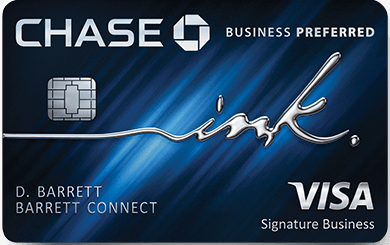 Home » Credit Cards » Earn 1.5x on every purchase your Small Business with the Chase Ink Business Unlimited. Earn 1.5x on every purchase your Small Business with the Chase Ink Business Unlimited. The Chase Ink Business Unlimited is advertised as a cash back card, but Chase allows you to combine the points you earn with their Chase branded cash back cards, with those that earn Premium Ultimate Rewards. The benefit? Access to a great list of transfer partners, and the ability to redeem your points for higher value. Let’s take a look at the card, the benefits, and whether or not it would be a good fit for your business. Personally, I think the Ink Business Unlimited is arguably one of the best small business credit cards out there. As we referenced above. Using this card in Tandem with the Ink Business Preferred or Ink Business Cash will maximize your earn rates. Since the Ink Business Unlimited earns 1.5x everywhere, you could utilize this feature to put all of your expenses that don’t earn bonus points on the Ink Business Preferred or Cash, on your Ink Business Unlimited. Pairing it with a Chase Sapphire Reserve will effectively give you 2.25cents back when used in Chase Travel. This card earns 1.5 cents back on all transactions. If you carry a Chase Sapphire Reserve you can transfer from the Ink Business Unlimited to the Reserve 1:1. Chase Reserve points can be redeemed for 1.5 cents a point in Chase Travel. 1.5 x 1.5 = 2.25. But I don’t have a small business, Miles. You may, and not know it. Keep reading. Chase is very friendly to entrepreneurs and small business owners. In fact, if you haven’t been in business for long, or you haven’t established yourself with an EIN, you can still apply as a Sole Proprietor ( fill in your SSN ). If you run a small side business (think bloggers, ebay sellers, tutors, consultants, etc) and want a card to segregate your business income from your personal income at tax time…this is a great opportunity to earn a load of points and help yourself out. Personally, I have two businesses that I run, one has an EIN, and one doesn’t. I still need to keep all of their records separate, and so I have cards for each business. If you have another Chase card that earns Ultimate Rewards you can access transfer partners through that account. That’s how I flew in EVA business class ( above ) intra Asia for just 27.5k miles each way by transferring and redeeming via Singapore Airlines. Yes. Every single card that earns Ultimate Rewards ( or cash back that can be converted into UR) is restricted by 5/24. However, Chase business cards don’t add to your number. Other uses for 50k ish Ultimate Rewards? 3 nights at Hyatt Category 4 properties. Take advantage of competitive great deals on Air France to fly US to Europe for 60k ( ish ) in business. 65k you could fly from the US to Europe on Star Alliance using Singapore miles. We do receive a commission when you use our links and we greatly appreciate it! Previous Article Wanna go Glamping on the Great Wall of China? Enter this contest. Next Article Win a $25 Visa Gift Card by interacting with us on Instagram! If it’s 0% APY for a year, why not put your money in a CD, high-yield savings, or T-bill?